You may have read both our budget and mid-range CPU summaries and probably been inspired to buy something within your price range. But a few of you are probably thinking, "I've got an extra £50 to £500 to spend on a processor, what can I get for that kind of money?" The answer lies here, in this round-up of £200-plus CPUs. You'll only find one AMD processor here, and it's right at the bottom - the rest is dominated by Intel's Core i7 architecture. Of course, this comes with a higher price tag for associated components, but if you're spending £750 on a CPU you've probably got enough to spend another £500 on a motherboard and memory. 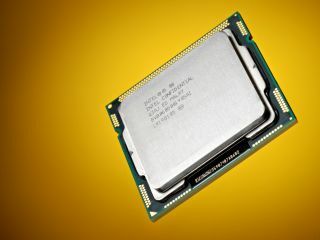 AMD's Phenom II X6 1090T Black Edition was the most expensive chip in our mid-range round-up, but here it's the cheapest. That doesn't mean it can't compete, though, and it's still the most expensive AMD chip we've recently looked at. It's that six-core performance that marks it apart, and Intel's cheapest sextuplet core is a whopping £400 more. Of course, it won't play games quite as nicely as an Intel chip, but for sheer multi-threaded performance it's a hugely impressive little chip. What's more is that you won't end up spending a small fortune on other components thanks to AMD's backwards and forwards compatible AM3 architecture. The big difference between Intel's Core i7 870 and lower-priced Core i7 chips is the inclusion of HyperThreading, which results in incredibly impressive performance in both gaming and media encoding. It's also eminently overclockable, and we managed to push ours from the stock 2.93GHz to a rather more meaty 4.33GHz, all with standard air cooling. It's an incredible piece of technology, too: it includes an on-die PCI Express controller, although this is limited to a maximum of two graphics cards. The price is the major sticking point here, but you are getting a super-duper processor capable of just about anything. Admittedly, the Intel Core i7 875K is pretty much exactly the same as the Core i7 870, above. There's one key difference, though, and that's the unlocked CPU multiplier, which makes for idiot-proof overclocking and takes memory clocks out of the equation. Unsurprisingly, our benchmarks for the 870 and 875K proved very similar, but it's those extra overclocking features that sell the 875K, such as its Turbo Mode. We were disappointed that they don't actually give the 875K a little more oomph in practical tests, but it's perfect if you're after an easily-overclockable Intel chip. It's here that we enter the realms of silly-money processors, but if you've got a spare £670 lying around Intel's Core i7 970 is the best chip you can buy. It - naturally - includes six cores capable of 12 threads, a billion transistors, and literally the most advanced PC processor die on the planet, all in 32nm silicon. Unsurprisingly, it delivers jaw-dropping performance across everything from game benchmarks to video encoding. It also playfully overclocks to 4GHz; hugely impressive given the sheer amount of processing going on. We're a bit worried about the longevity of the LGA 1,366 architecture, but hopefully the 970's incredibly steep price will drop once the LGA 1,156 is released. The 970 is turned up to 11. The Intel Core i7 980X is architecturally the same as the 970, but with faster clocks and an extra £90 added to the price tag. The result is that it's the fastest processor on the planet, bar none. Each core is tuned to an epic 3.33GHz out of the box, and we managed to push it as far as 4GHz on an air cooler without it so much as breaking a sweat. Again, we're a little concerned about the sheer price of the blighter, and the possibility of the LGA 1,366 architecture being abandoned. But, as it stands, this is the best processor we've ever looked at.